I am extremely thankful that Riley has already taken to books like she has. It seems that we are constantly reading to her and she loves every minute of it. Through all of our hours of reading time, I've discovered that most children's books are simply not that good. Most of the ones I've come across seem as if they were thrown together in about thirty minutes with just a very simple and unimaginative idea at the core. I've searched high and low and have found several children's book publishers which I've found to do a great job in producing quality children's literature. When I found out about the Funny Bone Readers: Developing Character set of books from Red Chair Press, I was intrigued. Would these books both entertain and educate at the same time? Keep reading to find out what Riley and I thought of them! I reviewed the Funny Bone Readers: Developing Character Parent Packs 1 and 2 from Red Chair Press, which retail for $24.95 each. 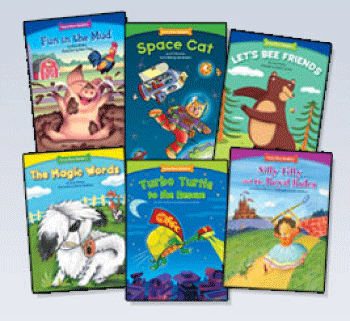 What originally attracted me to the Funny Bone Readers series of books from Red Chair Press was that these books claimed to have a moral to their stories, which would help teach life lessons to your child. This is a terrific concept and one that I think more children's book authors and publishers need to embrace. A story that would both delight and set an example for my child at the same time? This I desperately wanted to see! I had the fortunate opportunity to review both Parent Pack 1 and 2 in the Funny Bone Readers series of books and from the moment I set these down in front of Riley, she flocked to them and was immediately excited. Each and every one of the Funny Bone Readers was brightly illustrated and full of characters a young child would know well. Riley was excited to look at these well-designed pictures and start naming the things she knew. Within a few seconds, she had selected one for me to read to her right away. One of the great things about the Funny Bone Readers Parent Packs is that each parent pack contains a book that addresses one of the character issues above. So even if you only decide to purchase one of the two Parent Packs, your six books will still cover every one of the character lessons. Each book was around 15-16 pages in length and was long enough to aptly convey the message in the story, yet short enough to hold your child's attention. Each page had beautiful, full-color illustrations that Riley couldn't get enough of. What I really loved about the Funny Bone Readers was how they incorporated thoughtful questions about the main idea on the last page of every book. They also included a mini-dictionary for the harder words used in the story. These books are geared for children ages 5-9 to read by themselves, but I also highly recommend them for younger children too. Riley's two favorite Funny Bone Readers had to be the Fun in the Mud and the Helping Hands books. She wanted me to read both of these to her multiple times for she thought the characters in both of them were just too funny! 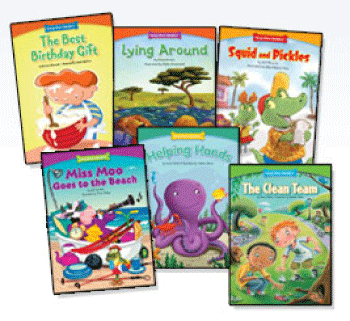 If you are looking for a great set of children's books which are guaranteed to also help teach character and values as they entertain, then I highly recommend the Funny Bone Readers: Developing Character Parent Packs 1 and 2. These twelve books are all well-written with beautiful illustrations that capture your child's imagination. I know that Riley will be enjoying these books for years to come. She likes them now when we can read them to her and she will like them even more once she can read them for herself! Disclosure: I received the Funny Bone Readers: Developing Character Parent Packs 1 and 2 from Red Chair Press in order to facilitate my review. No other compensation was received. This product review is based on my own personal experiences with this item and is completely honest and objective.